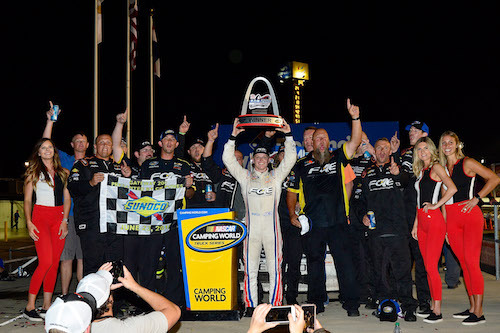 After 37-career NASCAR Camping World Truck Series starts, Justin Haley became a first-time winner in the series Saturday night when he took the checkered flag in the Eaton 200 at Gateway Motorsports Park in Madison, Ill., near St. Louis. Haley took the lead from Noah Gragson on a restart and led the final seven laps en route to his win. Those seven laps included a final restart with two laps remaining with Johnny Sauter alongside in second. Todd Gilliland got by Sauter to take second on the final restart to also post a career-best finish. Sauter finished third. Myatt Snider was fourth, and Zane Smith finished fifth in his Truck Series debut. After losing the lead to Haley in the closing laps, Gragson wound up 10th after a deflating tire and an unscheduled pit stop. Gragson led a race-high 63 laps, running up front for most of the 90 laps that made up the third and final stage of the 160-lap race. Brett Moffitt, though, did take the lead from him on a restart near the halfway point of the race and led 18 laps before his crew had difficulty fueling his truck, and he had to return to pit road because of the issue. Grant Enfinger won the first 35-lap stage and Christian Eckes the second. After starting on the pole, Enfinger led the entire opening stage. Then, Eckes took the lead during the caution between the first two stages through pit strategy and led the remainder of the second. Both drivers had trouble after their stage wins, though. Enfinger suffered multiple tire problems, the last resulting in an unscheduled pit stop in the final 20 laps. Enfinger was caught up in an incident with Stewart Friesen soon after his stage win. Friesen was able to continue, but Eckes retired to the garage after leading 34 laps. Other top-10 finishers included Chad Finley in sixth, Jesse Little in seventh, Riley Herbst eighth and Cody Coughlin ninth.